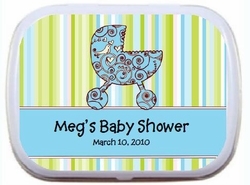 Personalized Baby Shower Mint Tins are a cool and refreshing way to thank your guests for celebrating your special day! 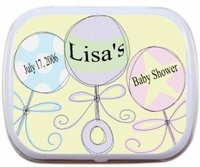 With trendy and fabulous designs, your guest will love these minty treats! 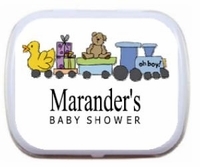 Choose from palm size tins, or the larger altoid size tins. 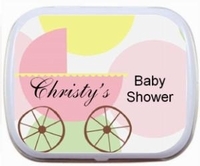 We can custom design a Baby Shower Mint Tin label for your FREE! 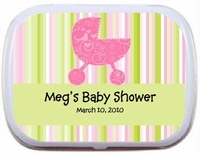 Whatever your Baby Shower theme is, we can design a label to match. Having Twins? No problem! All wording can be changed and customized by you. 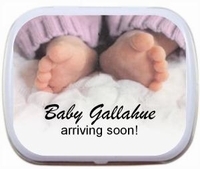 Feel free to email us info@candyundercover.com or call us toll free at 877-235-2828, and we will be happy to answer any questions, or help you design a personalized mint tin label for you. 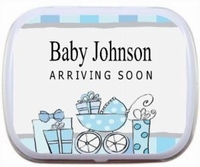 Click on any label design below to order your Baby Shower Mint tin.